CHILTON, Wis. (CBS/AP) Calumet County District Attorney Kenneth Kratz will remain in office despite sending 30 sexually suggestive text messages to a domestic abuse victim with whom he tried to spark an affair while prosecuting her ex-boyfriend last year. Stephanie Van Groll, 26, complained to the police last year after she received 30 sexually-charged text messages in three days from Kratz in October 2009. A police report obtained by The Associated Press shows a 50-year-old Kratz asking Van Groll, "Are you the kind of girl that likes secret contact with an older married elected DA...the riskier the better?" "I would not expect you to be the other woman. I would want you to be so hot and treat me so well that you'd be THE woman! R U that good?" Kratz wrote in another message. 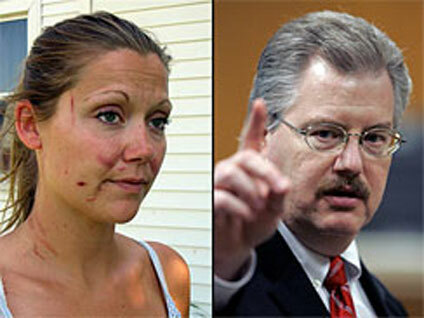 Kratz has been known for the past two decades as an advocate for crime victims. In a statement issued on Wednesday he said he was embarrassed about sending the inappropriate messages. Van Groll told police in her hometown of Kaukauna, Wis. that she felt pressured to have a relationship with Kratz and feared if she did not do so he would drop charges against her ex-boyfriend. Kratz was prosecuting Van Groll's ex-boyfriend on charges that he nearly choked her to death last year, but said he "immediately removed himself" form the prosecution after learning about the complaint. The state Department of Justice eventually took over the case, said Kratz. "Nothing really happened to him and I had three days of hell," said Van Groll in a phone interview with the AP. "They gave him a slap on the wrist and told him not to do it again. If it was anybody else that did something like this, they'd lose their job." Kratz said he stepped down from the crime victims board, which he helped create, after more than a decade as chair claiming a "self-imposed sanction." He and his wife filed for divorce last December. According to Van Groll, Kratz will not be charged because "they didn't think he did anything criminally wrong." Kratz, a Republican, will be up for re-election in November 2012.